I work with patients in my Stone Ridge, NY office in the beautiful Hudson Valley. The office is conveniently located between Kingston, NY and New Paltz, NY and serves the whole of Ulster County and beyond. Located in Sun Creek Center, it is a unique healing space. Like many others, you will feel a sense of relaxed comfort and peace just walking through our door. The building was built with environmental details in mind as well as client comfort. 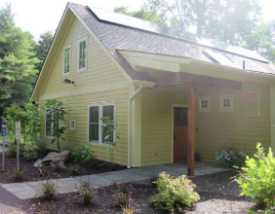 The solar panels on the roof offset our energy usage and the no-VOC paint was used in the interior for clients and patients with chemical sensitivities. For those outside the Hudson Valley area who are unable to consult with me in person, I also do functional medicine & nutritional consultations with patients via Skype/FaceTime. If you’re are not sure if my work is right for you, or have questions regarding whether or not I can help you, I do offer free 15 minute phone consultations for new patients. Call the office at 845-687-6387 or email me at drchrista@hvchiropracticandwellness.com to set up your consultation. The current fee schedule is $125 for the initial consultation which includes an exam and/or case review. These appointments are approximately one hour long. Follow-up visits are $47 and usually run 20-30 minutes. We accept Cash, Check, Visa, MasterCard and Discover for payments, which are due at the time of service. We can provide you a superbill if you would like to submit it to your insurance for reimbursement. It is my sincere desire to give each of my patients the very best care I can, not just what their insurance will pay for. In order to do this, I must have the time to be able to really listen to my patients and address their concerns. With current insurance reimbursements rates, I could not afford to continue doing the healing work that I do. However, I do understand that some patients will not be able to afford the out of pocket expense. If you are in need of the unique care that I offer, please contact me about your situation.